Harem anime series are something of a depreciated commodity in the anime industry these days. Once the undisputed king in the anime landscape in terms of fans, popularity and commercial viability, the harem genre fell from grace as viewers and fans became increasingly frustrated with the unsavory emerging patterns that became all too common around the early 2010s. Rarely if ever would these harem shows ever resolve the central question of which girl would ultimately win the battle for the main character’s affections, with full story adaptations almost never happening. On top of that, in order to cash in on the fantasy, anime producers, mangaka and everyone else involved in these kinds of stories would dial up the sexuality and fanservice up to eleven. What started as a very interesting and novel idea with the likes of shows like Love Hina, became nothing more than a repetitive, unsatisfying genre of misfires culminating in the industry as a whole abandoning the genre in favor of the next thing (which seems to be Isekai these days). Thus, its very interesting to see a show that wears the traditions of the harem genre on its sleeve, while still of course, providing its own twist onto the whole affair. 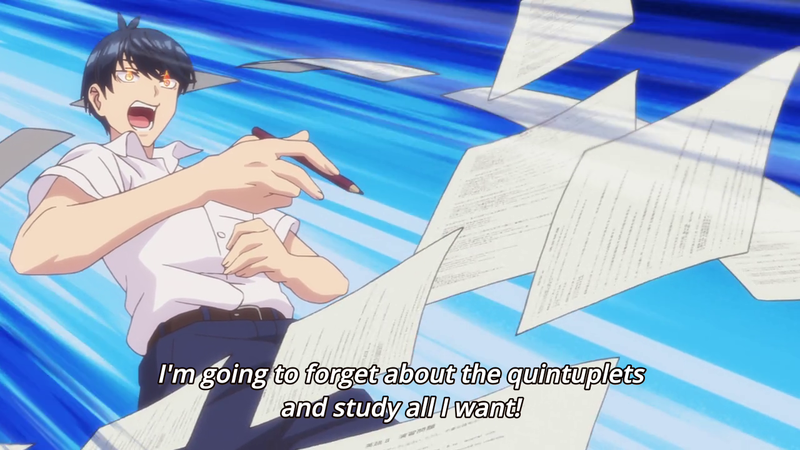 Quintessential Quintuplets is actually a harem show that features five sisters, Quintuplets if you will, all kind of vying for the same guy, who ends up being their tutor named Fuutaro. The five sisters are really extremely different, but ultimately close to one another, and all of them seem to be terrible at studying. The central idea is an interesting one, because a harem show has never really done the quintuplets thing before. Its an out there premise, but what makes Quintessential Quintuplets work as a show is in how it treats its characters and in how it sets up its story. The show actually opens up with a wedding scene, and the general idea is that Fuuutaro ends up marrying one of the sisters. Of course, since they’re all identical siblings, the viewer can’t really tell which girl he goes for, and thus starts the show proper. Again, for those who have become exhausted from the harem genre’s repetitive and more recent patterns, will actually find something pleasantly surprising in this show. 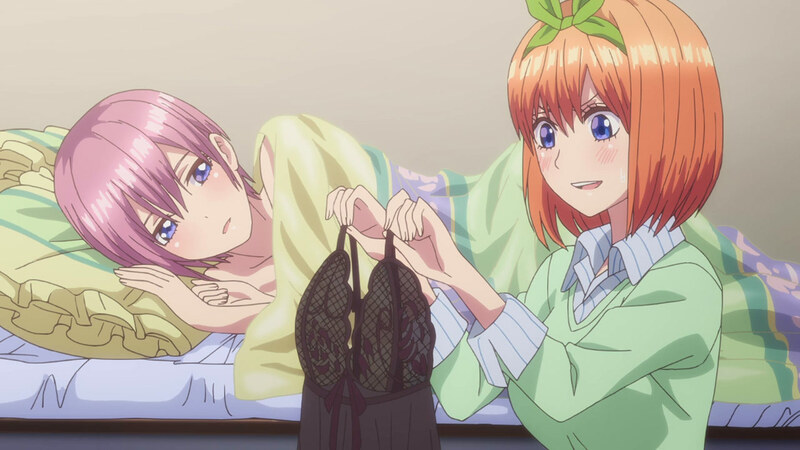 Simply put, Quintessential Quintuplets is actually good, and the reason for that is that it focuses on the things that made the harem genre such a commercial monster to begin with. The fanservice is kept to a minimum here, and the focus is on the characters and making them likable and easy to invest in. Rather than dive head first into the sexual fantasy that’s prevalent in the genre, the show actually takes the romcom + slice of life approach to its characters, world building and plot, which ultimately works in its favor. Things aren’t exactly realistic here, but there’s a general attempt to make things believable, and heart warming. The show focuses on character moments, develops each of the five sisters, and then goes a step farther and even makes Fuutaro quite the likable lead. Its been a while since I’ve seen a show where I basically like all the characters, and the general tone of the show is more relaxing and charming, than it is intense. 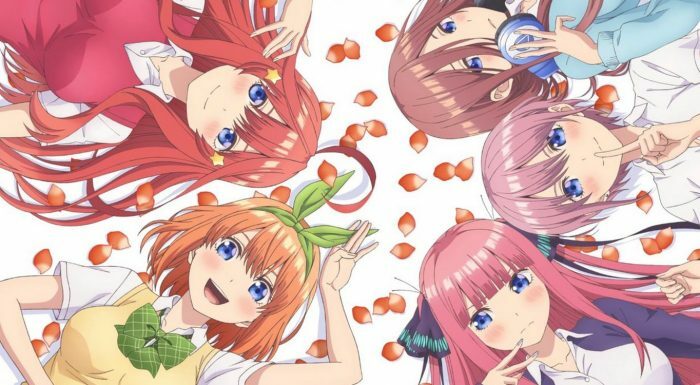 In another return to the now forgotten beginning of the genre, Quintessential Quintuplets actually tones down the drama, and makes the story of Fuutaro, Yotsuba, Itsuki, Nino, Ichika and Miku a story that refreshes, calms and heals. One of the big appeals of not just harem anime, but just anime in general is the escapist fantasy that the medium can often provide. And indeed, the lives of these characters are lives that are entertaining and just generally fun to watch. Every season needs a smaller, relaxing, low investment show, and Quintessential Quintuplets definitely starts off as such, before it gets its hooks into you, much like the classic harem anime of old. Of course, not everything is hunkey dorey with regards to this show. Since the show owns the fact that its a harem, it also runs into some of the more familiar issues that plagued harem shows, even in their heyday. For one, The story for the show definitely doesn’t resolve, with people having to follow the ongoing source manga to see where the story ends. That’s pretty common these days, but given that there’s no chance of this sort of show ever getting a season two, that’s a hard pill to swallow for those people who do end up falling in love with this show’s story and characters. On top of that, the show, despite originally starting with a unique premise, begins to dilute it a bit with ideas that are less original; i.e the inclusion of a childhood friend connection and promise between Fuutaro and the girls, and some more traditional situations like the “getting locked in a storage shed” with one of the girls. These things ultimately do bring down the overall strong first impression that the show initially makes, but doesn’t outright ruin anything. In a similar vein, The animation isn’t particularly impressive either, not that it needs to be. The Art direction is definitely competent, and works well for the sort of story that’s being told here. Again, the focus here is primarily on some conversations and intimate one on one moments. Rarely does the show need to flex its visual muscle. The one thing, however, that does stand out, is the voice acting. Harem shows basically live or die by their female cast, and this is a cast that really does bring life into their characters. 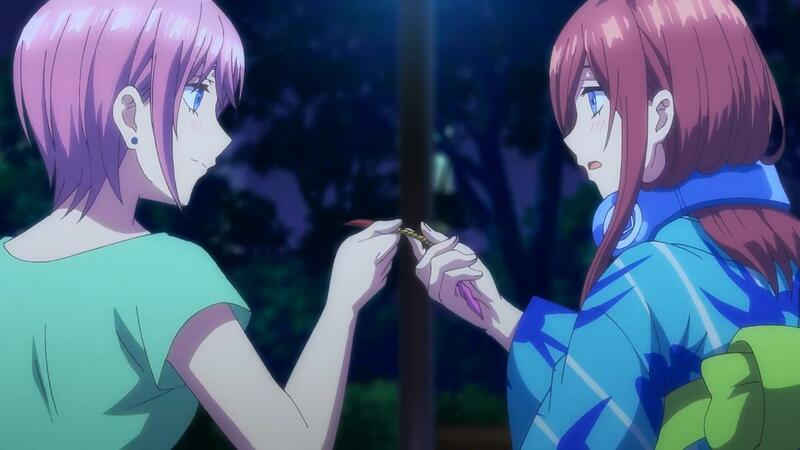 Each seiyuu does a remarkable job setting each sister apart, giving them a distinct voice and personality. While the story is definitely refreshing, calming and cheery, its the voice acting that brings forth the heart and emotion that balances it all out. 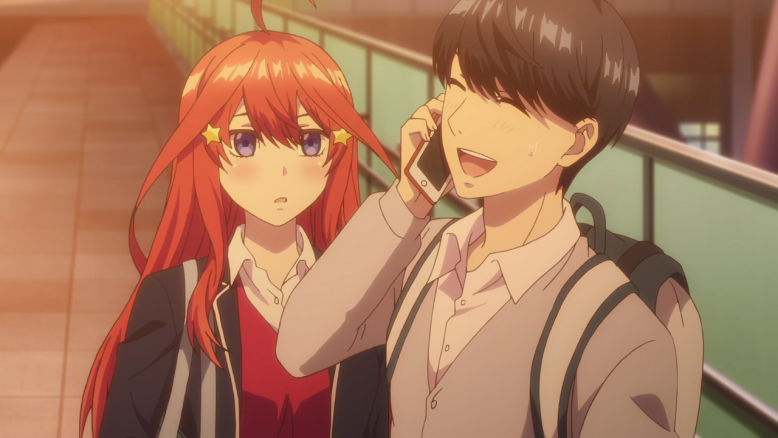 Ultimately, Quintessential Quintuplets feels like a homage and a return to form for a genre that’s needed to get back to basics. 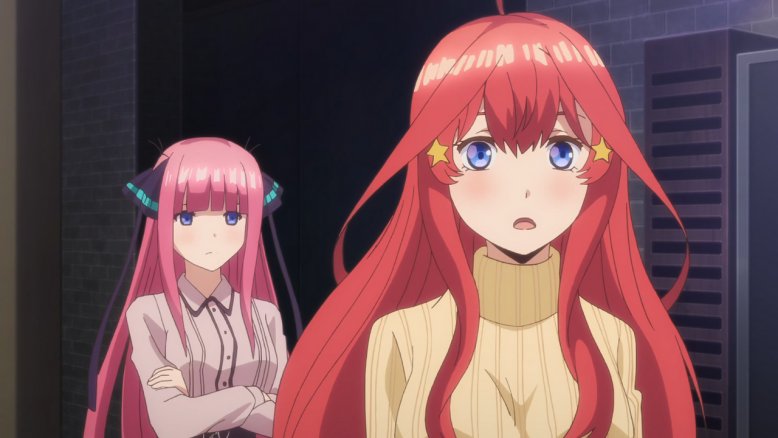 Quintessential Quintuplets innovates a tiny bit in its genre, while also highlighting some of the best bits of said genre. It also has some of the issues that have plagued the harem genre since its inception, and its clear that the show isn’t ever going to get a second season. 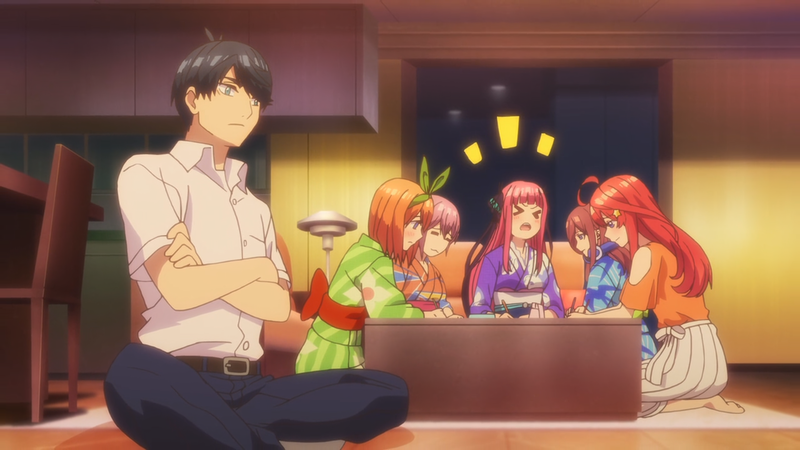 If you’re one of those people who miss the good old days when harem anime was actually good and entertaining, then Quintessential Quintuplets is a rare treat to behold. If you’ve never really seen the appeal of the harem genre, then this is a show that isn’t exactly going to change your mind, or really impress you. 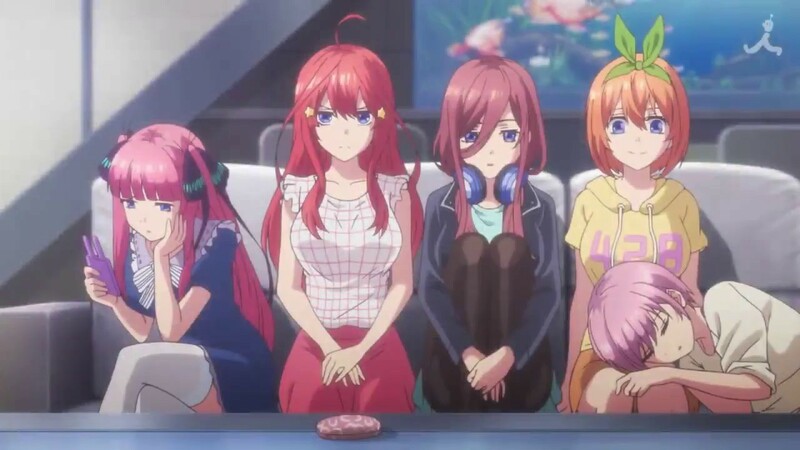 Of course, for those viewers who’ve previously liked the genre, or never really experienced it in its older form, Quintessential Quintuplets may very well pleasantly surprise. It gets a B Grade, overall.